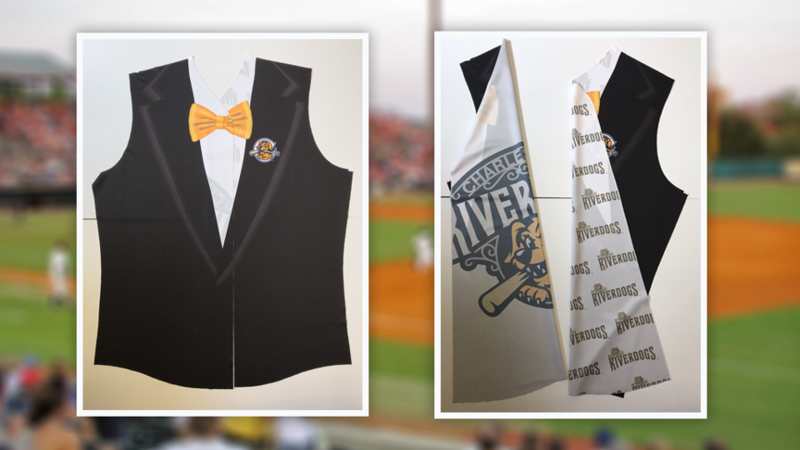 The Charleston RiverDogs are hosting NBA Draft Night on April 13, featuring unique suit jerseys lined with the team logo. Note: This is the third in a series of articles detailing the conception, evolution and execution of a new Charleston RiverDogs promotion. Part One ran shortly after the Minor League Baseball Promotional Seminar, an annual late September idea-sharing event that has since rebranded as the Innovators Summit. Part Two appeared in January. The Charleston RiverDogs unveiled their 2019 promotion schedule Thursday, the culmination of a months-long process that essentially began the moment the 2018 season ended. When MiLB.com last spoke with RiverDogs promotion director Nate Kurant, in January, he expressed excitement over an in-the-works "A-Z promotion" that had "a lot of different layers." Now it can be revealed. That promotion is April 13's NBA Draft Night, a sprawling celebration of professional basketball eligibility. As with all top-tier Minor League promotions, this one has a strong visual element. The RiverDogs partnered with OT Sports to create a first-of-its-kind theme jersey, modeled after the eye-catching formal wear worn by top basketball prospects on draft night. The jerseys resemble black suits, complete with a yellow bow tie and a RiverDogs logo lapel pin. "The jersey designed like a suit, that's not original. A lot of teams have done versions of that," said Kurant, entering his fourth season as RiverDogs' promo director. "But what's creative and unique -- and this is something that OT Sports had never seen before -- is that you can open up the jersey like a suit jacket and our logos are on the inside panel." The jerseys therefore bring to mind a common NBA Draft fashion choice, in which prospects open their jackets to reveal colorful (and often personally meaningful) artwork on the inside of their suit jackets. "So we've got the visual. We think people will get it," Kurant said. "It's the hook that gets the headline." While the jersey provides the hook, it's not the evening's slam dunk. The RiverDogs' NBA Draft Night occurs approximately seven weeks prior to the June 20 draft, and that is for a very specific reason: The NBA's collective bargaining agreement stipulates that any individual who is at least 19 years of age and one year out of high school can declare eligibility for the draft by notifying the NBA office in writing. This notification must be received at least 60 days before the draft occurs. Thus, RiverDogs fans attending April 13's game can fill out the requisite paperwork to become draft eligible. "When I found the collective bargaining agreement and saw the eligibility requirements, I sent that part to our team lawyer, 'Am I missing something?'" Kurant said. "He said it all seems fine and above board. ... So our schtick is that fans can declare in writing and we'll send a pack of certified letters to the NBA. Hopefully, we're not creating too big a headache for them, but if it all goes through, then in theory these names will be in the pool of draft-able people. It's a little footnote, maybe something people can put on their resumes. A good cocktail party anecdote." The perks of the evening don't end there. The RiverDogs will award a shoe deal to one draft eligible fan, in the form of a pair of size 17 sneakers. Meanwhile, CJ Rizzo, a team intern and law school student, will be available as a sports agent for hire. Whether draft eligible or not, RiverDogs fans will have the opportunity to win $1,000 in a postgame on-field "half-court" shooting contest. The original plan was for the team to stage the "world's largest game of knockout," but Kurant said, "logistically, we couldn't figure it out." Kurant, having struck out with Charleston native Kwame Brown and Charlotte Hornets mascot Hugo, is still working to confirm a celebrity guest. ("SportsCenter on Snapchat" host Cy Amundson, who attended the RiverDogs' 2018 Jamaican Bobsled Night promo, is a possibility.) Kurant is also reaching out to Charleston-area collegiate basketball standouts, in search of an individual who could declare his draft eligibility at the ballpark while maintaining at least a remote possibility of actually being drafted. "There's no word on whether 'Space Jam' star Bill Murray will be in attendance," Kurant added, referring to the RiverDogs' enigmatic A-list co-owner. Additional elements include "dunkable" items at the concession stands (think chicken nuggets and funnel cake fries), basketball youth league teams, themed merchandise in the team store and between-inning games such as the "Little Kid Dunk Contest." Like any premier Minor League promo, the whole will be greater than the sum of its parts. But will it be great enough? In 2018, the RiverDogs came up short in their quest for a Golden Bobblehead, peer-voted awards which recognize the top Minor League Baseball promotions of the year. Will "NBA Draft Night" finally put them over the top? "It's definitely got potential," Kurant said. "The Innovators Summit is all about big ideas and creating new things. Hopefully, we've created something that is seen throughout Minor League Baseball and beyond as something that's fun and innovative. That fits with what we're trying to do as an industry."